The image of this colorful sign is obviously meant to be “fun” and perhaps even funny. 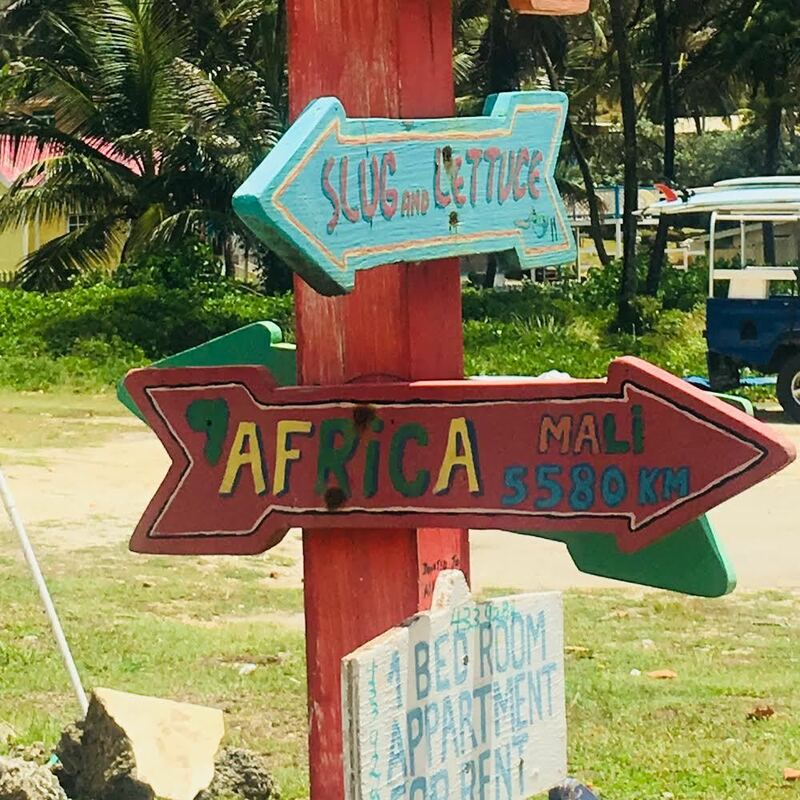 When I took this picture while traveling with fellow teachers and educators in Barbados, it honestly was because I thought the sign was kind of cute. But later on that day, when I thought about the sign and about looking East across the Atlantic Ocean, I had mixed emotions. The image seemed cheerful, but thinking about the sign marking the distance to Africa’s west coast made me feel anything but. All I could think about was that a few hundred years ago, African slaves on that coast were forced onto ships in chains. Those people endured a horrific journey of thousands of miles that lasted for several months, during which they endured most gruesome, horrific, inhumane treatment imaginable. Men, women, and children were separated from their loved ones, herded onto ships like animals, and packed into tight spaces to maximize cargo and profit for their captors. Many died of disease, suffocation, or drowning by throwing themselves overboard because they would rather die on their own terms than face whatever horrors awaited them at the end of their journey. Those that survived were whipped, beaten, starved, and then sold on the island of Barbados to grow sugar cane and face some of the shortest lifespans for slaves anywhere in the Western Hemisphere. These thoughts make me really upset. It’s a mixture of sadness, anger, shame and guilt that I used to push out of my mind when talking about or teaching about slavery or other less-than-cheerful topics in history in order to seem more objective or “removed”, but now I embrace those feelings. I use them to check my privilege, and to fuel the fire in me as a teacher and lifelong learner to learn as much as I can about the events and people in history who are so often underserved or overlooked because they aren’t “pleasant” or nostalgic enough to be “fun” to teach or learn about. My trip to Barbados was an eye-opening one in many ways (some unexpected). I discovered that some of my own ancestors are buried on that island, and I learned that they were sugar planters and slave owners. This discovery further affirmed my belief that everyone is connected. Those connections might be rooted in the past, but they shape our present in ways that we don’t always fully, consciously acknowledge or understand. I wasn’t surprised by this information, and I also make no effort whatsoever to hide it. I don’t want to hide it. I don’t want to feel neutral or indifferent about it. I don’t want to ignore it or bury it or pretend that it doesn’t matter. It does matter. It matters because my privilege as a white person living in the United States is built on the forced movement and enslavement of African people. My ancestors came to the Americas of their own free will, and profited from slave labor in Barbados before they moved further north to Virginia. Those are the facts. The life that I now live and the comforts that I enjoy are byproducts of slavery, and to deny that fact would be unconscionable. As a teacher, it is my responsibility to convey to my students that the impact of slavery cannot be underestimated. It is my job as an educator to not only be an objective purveyor of knowledge and information, but to help students contextualize why historical truth matters and how white privilege allows people to feel neutral and indifferent about slavery. Removed or neutral feelings about slavery are artifacts of white supremacy. Slavery isn’t something that should be taught only as a part of a unit on European Exploration and Colonization of the Americas. The Atlantic Slave Trade defines the American experience for all of us. The modern history of this entire hemisphere and of the entire world is defined by it. In my 10th and 11th grade classes, students do have questions about slavery and the slave trade. Unfortunately, they often sound a bit like this: “It happened, it was bad, but should we really worry that much about it? Do we really know what slavery was like? Do we really need to talk about it that much? Does it really affect people living in the 21st century?” This trip to Barbados, and the humanities moment that I had there only reaffirmed my belief that the answer to all of those questions is: YES. A sign that I photographed while on the Atlantic coast of the island.